My friend Lauren and I have been playing this game that had rapidly become one of my favorite pastimes. If you're a writer or if you'd like to be a writer or if you think you could never write anything creative or if you think writers have superpowers and that's how they make stories, then this is for you. Yes. I'm bringing our game to the masses - if the masses mean the 50 people who are going to read this post. I "send" you a list of emojis. Since we're playing this over the interwebs, I'll post them here on Wednesday morning. Then you make up a story using the emojis as your inspiration. You post that story by Thursday at 5:00 pm either (a) in the comments here or (b) on your own blog and share the link to it in the comments on this post. On Friday, I'll post my own story and I'll pick one from the comments to highlight. If you're feeling shy, post yours anonymously. 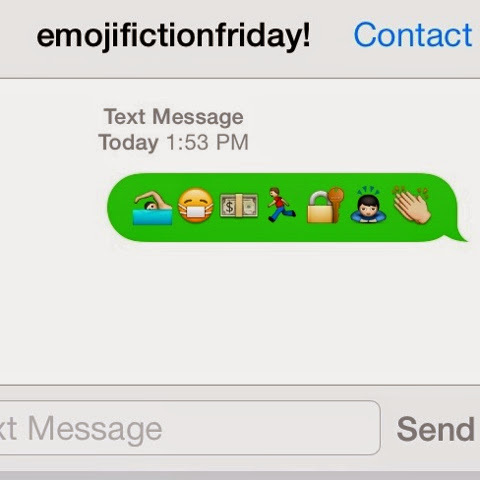 But I guarantee you that writing emoji fiction will make you laugh and take your mind off your troubles for at least 15 minutes.